Artist Axel Yberg is like a mad scientist with a whimsical bent. When he emailed me about this poker table, he had me at Madagascar Ebony (One of fifteen species of exotic wood he used.) “All In” will be awarded to the World Poker Tour’s Season XI Player of the Year. “All In” required over 600 man-hours of labor to create. 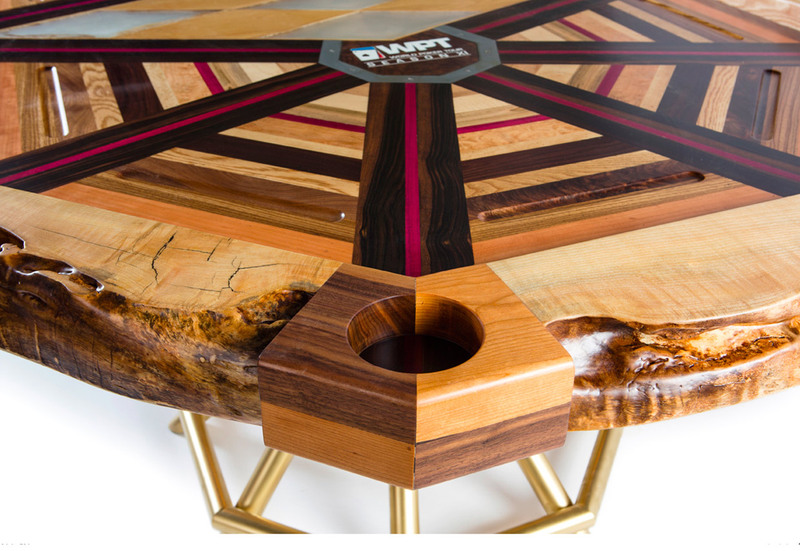 The surface was constructed using fifteen species of exotic wood (including: Madagascar Ebony, Rosewood, Purple Heart, Zebra Wood, Wormy Maple, English Brown Oak, Black Locust, Claro Walnut, Quilted Maple, Sycamore, Cherry, Catalpa, Black Walnut, Quarter-Sawn White Oak, and live-edge Ash). The base was fabricated with gold-painted plumbing pipes and fittings, and Edison Reproduction Light Bulbs. 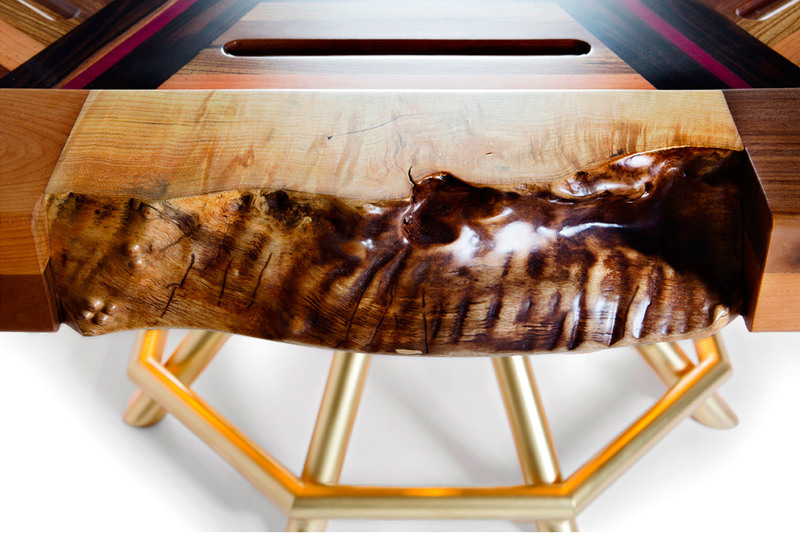 The vectors that bisect each angle on the perimeter of the table are made from Madagascar Ebony and Rosewood. Their colors, black and red, represent the suits in a deck of cards. This idea is carried into the turnbuckle drink holders, which are designed as a quadrant of Black Walnut and Cherry. 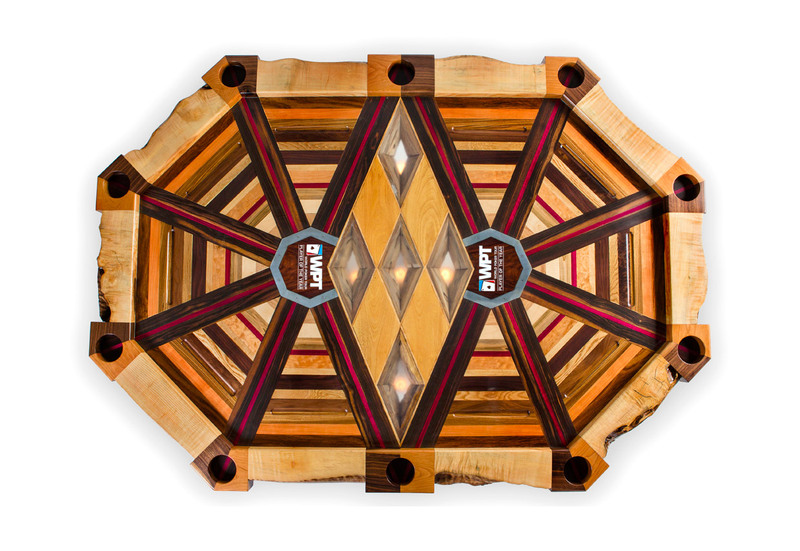 The organic nature of the live-edge Ash on the perimeter of the table symbolizes the fact that the game of poker requires complex thinking, as opposed to a systematic game like Black Jack. To be a successful poker player, you must have plenty of skill, nerves of steel, and a good amount of luck. The steel horseshoes that surround the WPT logos symbolize that combination. 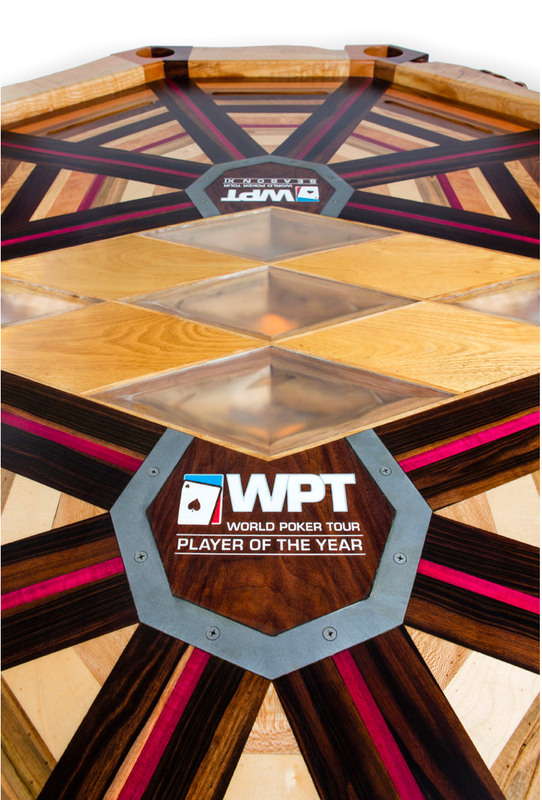 The five diamond cutouts in the center of the table are a nod to the legendary Doyle Brunson and the WPT Doyle Brunson Five Diamond World Poker Classic. And of course, the gold pipes that make up the base represent the bling associated with Las Vegas. This poker table wouldn’t exist if it were not for the generosity, excitement, and total belief in me that I received from my good friend Matt Gai and his wife Jenn. They funded this table (and it was very expensive). I am extremely thankful for this. 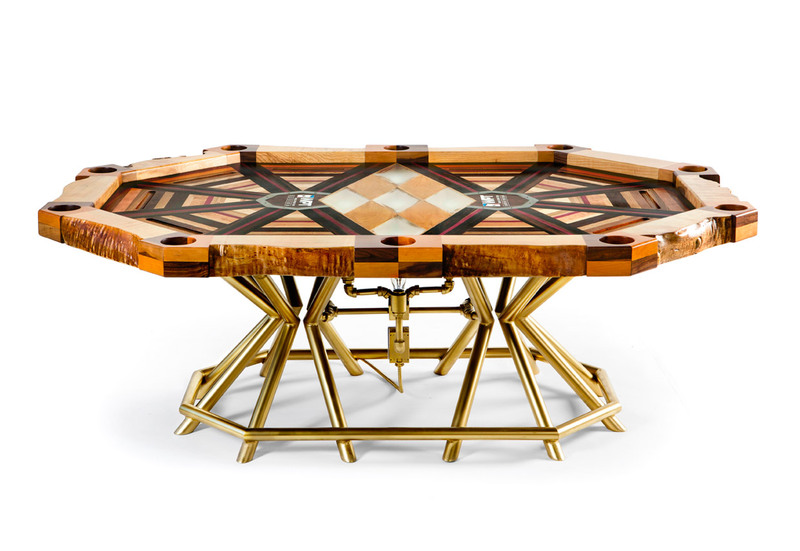 In addition, Matt, an avid poker player, was instrumental in consulting with me regarding the necessities of creating a functional poker table. “All In” will proudly be awarded to the World Poker Tour’s Season XI Player of the Year.